There are three types of teals found in North America. 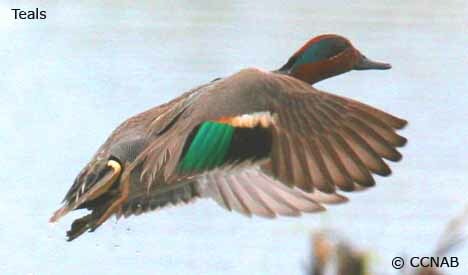 The Green-winged Teal and Blue-winged Teal are the most common and located over much of the continent. The Cinnamon Teal is found throughout the central USA, also out to the west coast and into Mexico. These small waterfowl are known for their quick flight and aerial manoeuvre, where they twist and veer in tight formation. The teals mostly prefer shallow waters and mudflats, where they dabble for their food and sift through the sediment for forms of life. The male teals change from a dull non-breeding plumage to a bright and colourful plumage with many distinct markings. While the females remain in plain plumage year-round. The Silver Teal is a southern vagrant and is most often an escape species that is sometimes seen in waterways and parks.